Sepp Blatter has announced he is stepping down as president of FIFA, football’s governing body, and has called on a special congress to elect a successor. 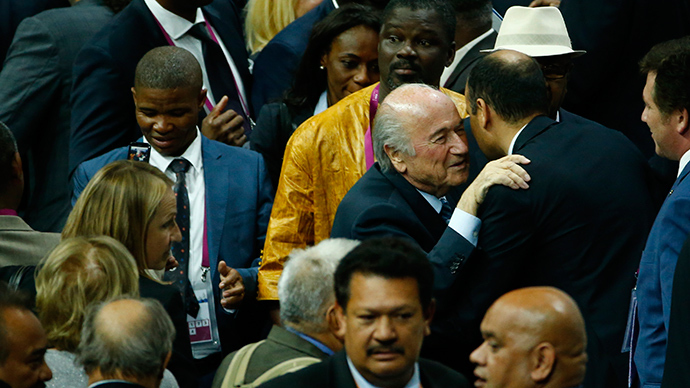 The news comes less than a week after Blatter was reelected as FIFA chief amid a bribery scandal. A former senior FIFA official, Chuck Blazer, claimed he and others took bribes in exchange for supporting World Cup candidate countries in 1998 and 2010, an unsealed paper says. The transcript of the testimony in which Chuck Blazer, the key senior FIFA official who admitted corruption and indicted many of his colleagues has been unsealed. Overwhelmed by the torrent of revelations, some are taking a lighter approach. The US is incredibly successful at solving problems it doesn't care about. #FIFA Now, how do we make them stop caring about the Middle East? The White House has welcomed Blatter's resignation. "It's apparent from recent news reports they'd benefit from some new leadership and this is an opportunity for that organization to try to improve their public image and to make sure that the actions of that organization are consistent with their mission," said White House press secretary Josh Earnest during a media briefing. German Chancellor Angela Merkel has said she hopes that Blatter's resignation will signal a "new beginning" for FIFA, and "set it on a path to transparency." FIFA's decision to award the 2018 and 2022 World Cups to Russia and Qatar respectively, is also being investigated by the FBI, a source within the agency told Reuters. FBI refused to comment on the revelation when openly contacted about it by Russia's RIA news agency. Moscow was surprised by Sepp Blatter's decision to resign – spokesman Dmitry Peskov, according to RIA. The Kremlin has refused to address any alleged fears that that the next World Cup may not be held in Moscow, now that Blatter is gone. “We don’t know who the new FIFA head is. We know the decision is not going to be announced tomorrow or the day after, but much later. So let’s not get ahead of ourselves here,” Peskov told journalists. The spokesman added that it's “certainly a difficult situation”, though admitted to not having heard of any specific accusations the US has allegedly been making against the former FIFA head. As for the preparations for the upcoming 2018 championship in Russia, Peskov said the work is still on. Sepp Blatter is reportedly under FBI investigation as part of the inquiry into the alleged corruption at FIFA, according to American media. US officials said that last week’s indictments of 14 FIFA officials could lead to a case against Blatter. "Now that people are going to want to save themselves, there’s probably a race to see who will flip on [Blatter] first," a source told ABC News. "We may not be able to collapse the whole organization but maybe you don’t need to." “The challenge is not just to change the top elected position, but the governance structure at all levels and the culture that underpins it,” the statement said.